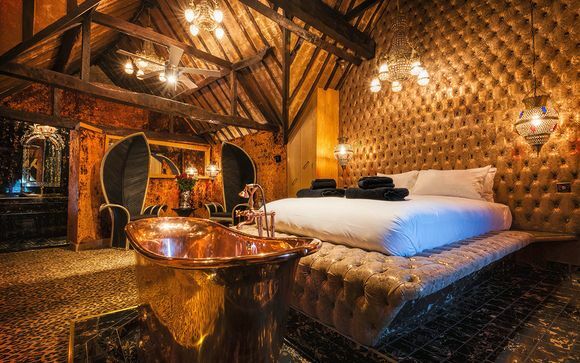 Welcome to a unique oasis in the countryside and the foundation for the Crazy Bear brand – The Crazy Bear Stadhampton 5*! Situated in 80 sprawling acres of working farmland, this iconic hotel boasts 2 restaurants, lavish interiors and luxury facilities. Our members benefit from exclusive Champagne, a lavish three-course menu and more. Located in the lush, green landscape of Oxfordshire, and just a 20-minute drive from Oxford city centre, this hotel is surrounded by an abundance of natural beauty for you to explore. Within the region, you can also indulge in some retail therapy at the Bicester Shopping Village, featuring chic designer outlets so you can live the life of luxury. As you're in the heart of England, the Oxfordshire Cotswolds is a necessary destination due to its rich heritage and scenic appearance. Charming market towns, award-winning pubs and restaurants, and a luring array of independent shops are certainly enough to want to visit this classic English countryside location. Make sure you go to Blenheim Palace for a real historical day out! This is the original hotel in the Crazy Bear brand - open for guest enjoyment and indulgence since 1993! Nestled within 80 acres of glorious, working farmland, this hotel represents total opulence, from its sprawling gardens to its award-winning restaurants and innovative design. When this hotel opened, it was the first of its kind, representing fully the charming Crazy Bear experience that is iconic today! 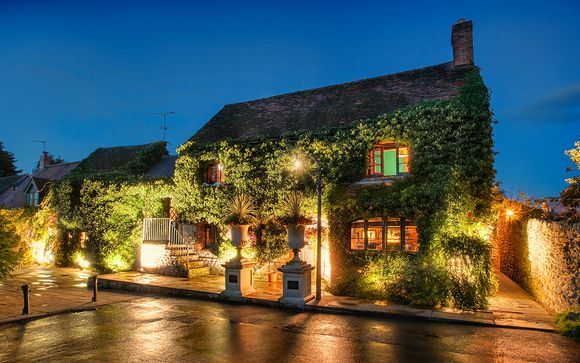 Boasting English and Thai restaurants, Thai massage services, a farm, a farm shop, and a spectacular terrace, this hotel is sure to steal your heart! This offer is based on a choice between an Original Room, a Deluxe Room, a Superior Room and a Suite. Each of the hotel’s Original Rooms are individually designed, featuring marble wet rooms with luxurious shower and Bang & Olufsen sound and vision – the ideal way to experience The Crazy Bear brand on a smaller budget! 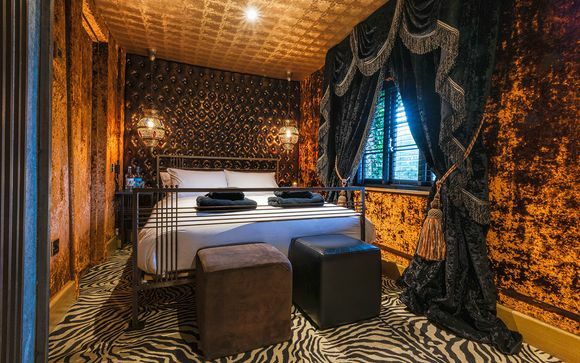 Featuring statement pieces such as animal print carpets, velvet bed frames and mirrored glass tables, these rooms are a showcase of innovative design and wild imagination! Guests are sure to be blown away by their comfortable size and the quality of their furnishings. 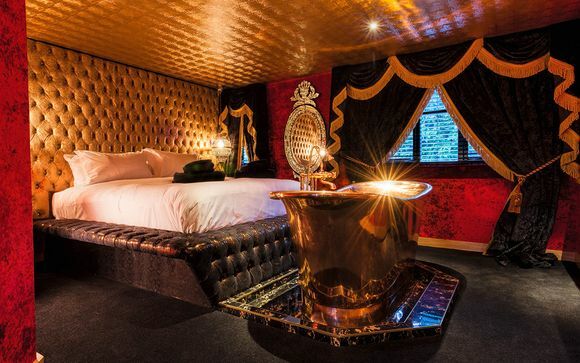 These rooms are Superior indeed, complete with soft velvet walls and all of the quirkiness that you would expect from The Crazy Bear. And even more space than the Deluxe Rooms! The hotel's Suites are all individually designed, presenting a unique hotel experience for guests in search of the utmost luxury. 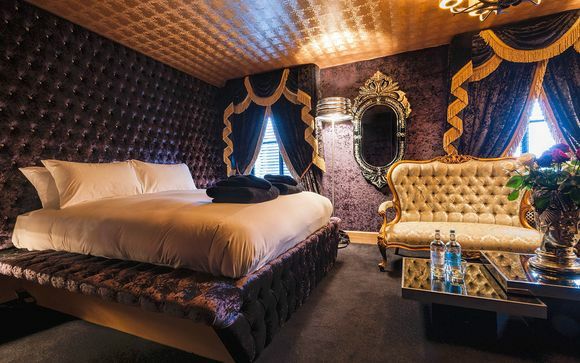 Complete with huge, inviting beds, leather, velvet and mirrored furnishings, and the highest quality amenities, these Suites represent the best The Crazy Bear Stadhampton 5* has to offer! This offer is based on a Half Board Stay (continental breakfast and evening meal served in one of the hotel's two restaurants - excludes drinks). The hotel's English Restaurant has managed to maintain 2 AA rosettes every year since it opened. Serving everything from breakfast and afternoon tea, to signature and a la Carte dining options, this is the place to be! Their smoked products are even smoked in their Farm Shop, while their pork and lamb is reared at the Crazy Bear Farm! True, local produce that is sure to put a smile on our guests' faces! The Thai Restaurant has also maintained 2 AA rosettes every year since it opened. It caters for a variety of tastes with modern, oriental dishes. Please note however that the Thai Restaurant is closed on Mondays. 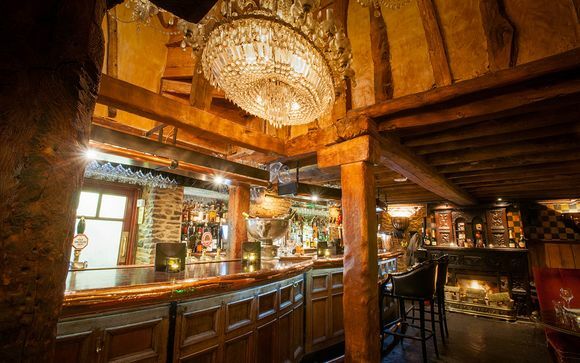 The bar is a sixteenth-century public house, which acts as the heart of the hotel. Here, guests can find a variety of hand-crafted cocktails, beers on tap, premium spirits, and small plates! Please note: some dining outlets/menu items and premium, branded and international drinks may not be included and may incur a surcharge payable locally. Meals, snacks and drinks may be available at selected times only. Distance from Oxford Train Station to The Crazy Bear Stadhampton 5*: 15.6 km / 32-minute drive. Please Note: This offer is Non-Refundable and Non-Transferable and cannot be booked in conjunction with any other offer that is existing or otherwise. The date of the booking cannot be changed. Please Note: A credit card pre-authorisation of £150 will be required at check-in to cover any incidentals during your stay - this will be released following bill payment at check-out. - This offer is valid for two adults sharing (minimum age requirement is 18+ years). 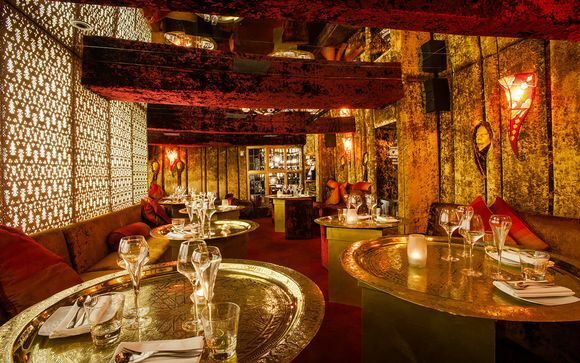 - Advance booking is essential for restaurant reservations. Bookings are subject to availability so please book in advance. - Continental breakfast is served in the English restaurant from 7 am to 10 am. - A three-course dinner from a set menu is served in the English or Thai restaurant (please note that the Thai restaurant is closed on Mondays). - Set menu dishes cannot be swapped or changed. - Dietary requirements cannot be catered for, including vegan etc. - Dishes may vary from sample menus. - A discretionary service charge of 13.5% will be added to your final food/drinks bill. - The full package is to be used in one visit.